The instruction of the delegate general to the National Security (Dgsn), addressed to the general direction of the external research (Dgre), the secret services Cameroon, is contained in a message- worn, and dating from 15 August 2018. The note which calls for action in "the shortest possible time", aims John Mbah Akoruh, a former journalist of the state - owned radio - television of Cameroon, the Crtv. 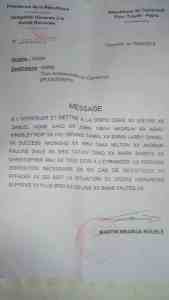 Below, the message - from the Dgsn to the Cameroonian secret service.